Gazans attempting to damage Israeli security fence on Gaza border shot by IDF units as ‘March of Return’ riots continue. IDF forces stationed along the Israel-Gaza border opened fire Sunday on several terrorists at various locations along the frontier while they attempted to tear openings in the security fence separating Israel from the Hamas-ruled Gaza Strip. 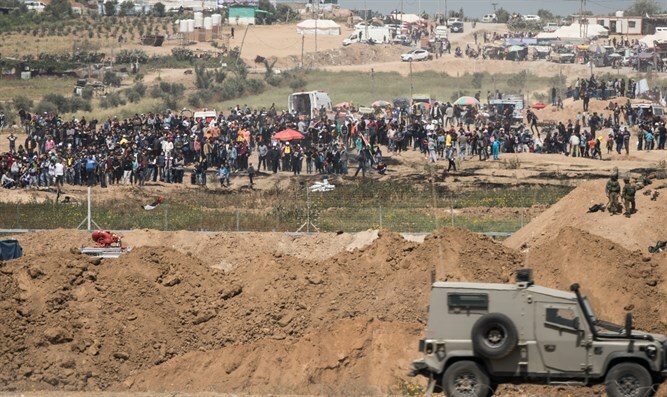 According to Palestinian Authority media outlets, three Gazans were wounded Sunday after they approached the Israeli border security fence and attempted to damage it. Israeli security personnel opened fire on the would-be infiltrators, wounding three. Israel has yet to respond to the reports. Terrorists have taken advantage of the ongoing riots along the Israel-Gaza frontier to attack Israeli forces stationed on the border, and attempt to infiltrate into Israel. Since March 30th, tens of thousands of rioters have clashed with Israeli security forces along the border, in what organizers have dubbed the “March of Return”. Beginning on the 42nd anniversary of the 1976 Land Day riots, the riots are expected to last six weeks, culminating in a mass-demonstration on May 15th, the day after Israel’s 70th Independence Day, which Hamas and other terror groups mark as “Nakba Day” – the “Day of Disaster”. Health officials in Gaza claim 39 rioters and terrorists have been killed since March 30th, with more than 4,200 reportedly wounded or injured. Rioters have used firebombs, flaming tires, and improvised explosive devices on kites to attack Israeli forces. Terrorists have also attempted to attack Israeli forces using firearms and roadside bombs.